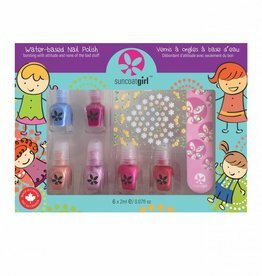 These fun, colourful nail polishes are also safe and natural! Canadian made, water-based, fast-drying and durable. Suncoatgirl polish is also peelable, which means no polish remover is required. These fun, colourful nail polishes are also safe and natural! Canadian made, water-based, fast-drying and durable. This kit contains 2 full sized (8.5ml) water-based peelable nail colours, 1pcs 7ml all natural lip gloss and 1pc pressed powder blusher/eye shadow packaged with a built-in mirror and a applicator. This kit contains 2 full sized (8.5ml) water-based peelable nail colours, 1pcs 7ml all natural lip gloss and 1pc pressed powder eye shadow packaged with a built-in mirror and a applicator.